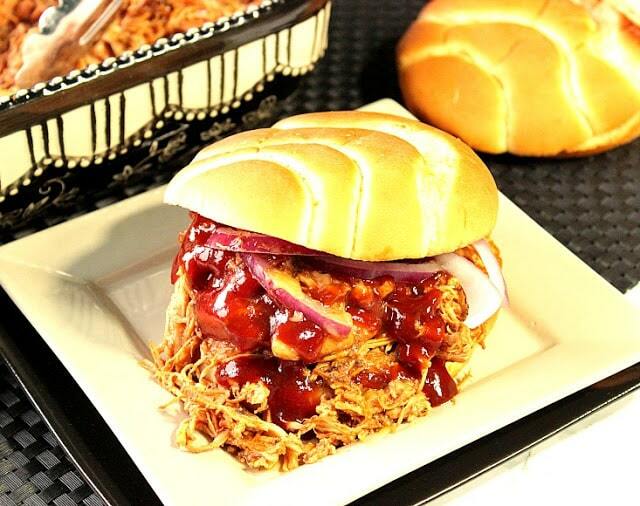 When you need to feed a crowd during the holidays with something that’s delicious, and completely stress-free, these Slow-Cooker BBQ Pulled Chicken Sandwiches are just what the doctor ordered. Let’s face it, the holiday season is a busy one. There are parties to attend (or host), gifts to purchase and wrap, children’s school programs to go to, and all the additional family holiday activities to coordinate. Not to mention all decorating and holiday baking that goes into making the season merry and bright. 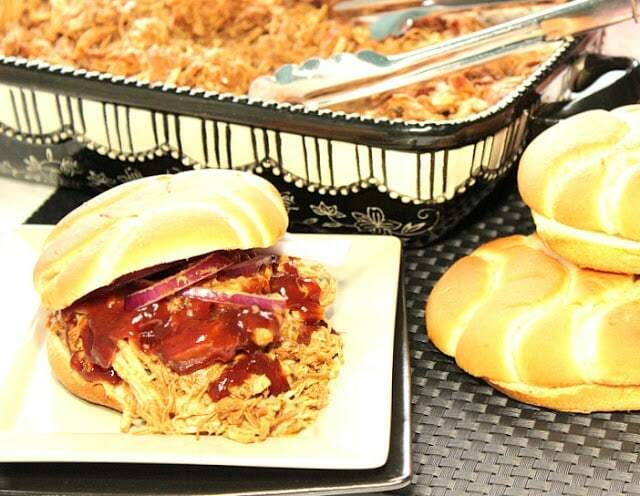 Even if you’re not serving this BBQ Pulled Chicken for a party, because it makes a lot you can store it in the fridge for up to week for your family to heat-and-eat on all those busy holiday evenings. Plus, it freezes wonderfully well so if needed you can divide it up into smaller portions for those times when there’s no time to cook but you’re craving a home-cooked meal. -Add the chicken to the cooker. Add in the next 8 ingredients. 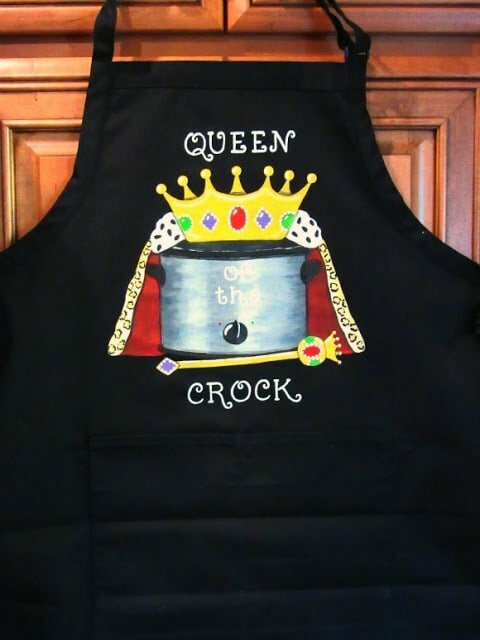 Cover and cook on high for 8 hours. -Remove the chicken to a bowl or dish using a slotted spoon and shred with two forks. Add additional cooking liquid if desired and additional BBQ sauce as needed. 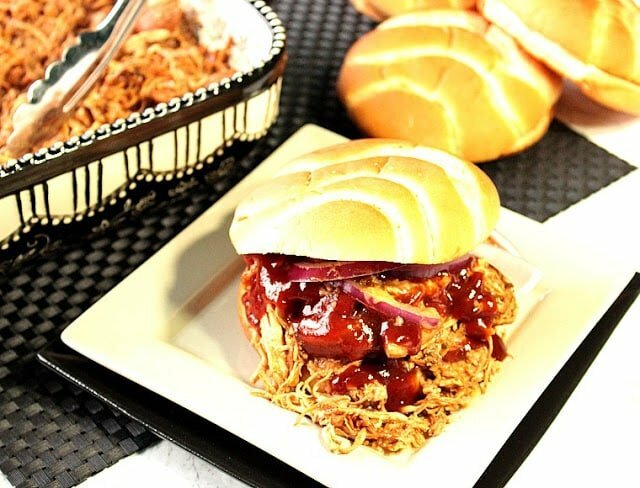 -Serve on buns with additional BBQ sauce, onion slices and dill pickle slices if desired. 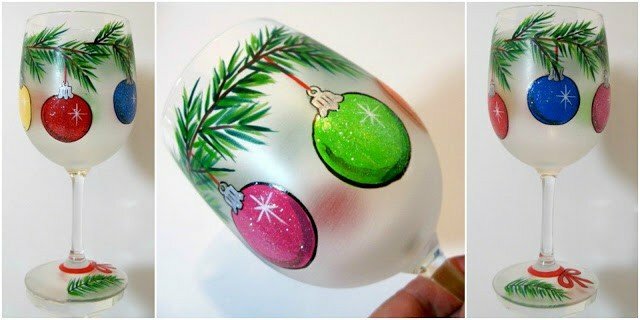 If there is ever anything I can paint for you, from fabrics (aprons and tea towels), to glassware items, please don’t hesitate to contact me or visit my shop on Etsy. Custom orders are always welcome, and I will happily design and work from any photo or description you send my way. I think I might make this for diner tonight! Looks so good! Yep, I could go gladly go for a huge one of these right now for lunch! 🙂 The addition of the cherry cola sounds awesome! I love easy, simple dinners like this that my whole family will love! I love the idea of using the breast and the thigh, smart!! This sounds fabulous, and with all the entertaining coming up it is perfect timing! I love the combo of chicken types – fantastic idea! I can already taste how juicy it will be! 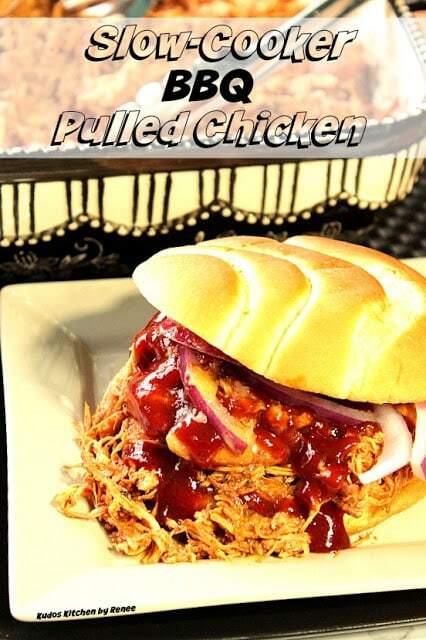 This pulled chicken looks fantastic! And a great way to feed a lot of people! Especially when everyone is coming in and out of town on the holidays! 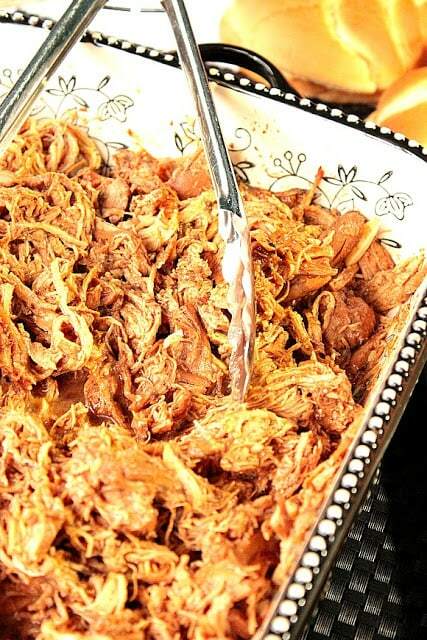 A dear friend of ours makes the most amazing pulled pork and I always look forward to their parties, because I know I'll get to make a sandwich. Your pork looks fantastic, Renee! I am going to have to make it during the holidays! I swear, I could probably eat these for an entire week and not get sick of them – they look DELICIOUS! Move over pulled pork! Pulled chicken is someone on through 🙂 This sandwich looks awesome! I would happily eat it on a bun or simply in a bowl. 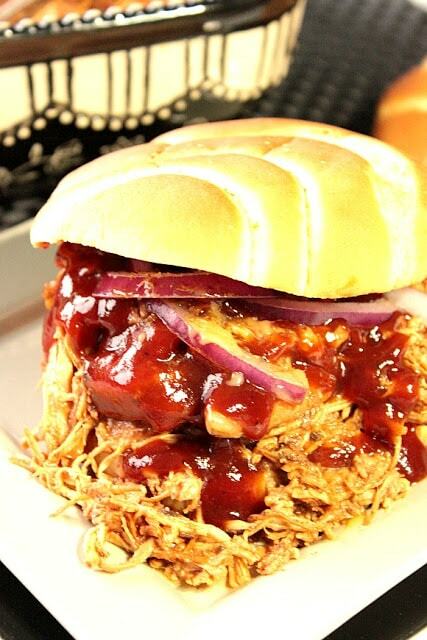 I love pulled chicken sandwiches! Such an easy weeknight dinner. Pulled chicken sandwiches are so great for parties, or if you're like me, shredding up one day and reinventing the leftovers all week. You just saved us from starvation the week leading to Thanksgiving! This looks so good. The horseradish is a nice twist.